Dynamic Design - LG combines the best of style ad technology in the new LG Watch Sport. Featuring both Android Wear 2.0 plus a bold new look. Watch Case Material Stainless Steel. Watch Case Color Silver. LG Watch Urbane Wearable Smart Watch - Silver - LG-W150S. Manufacturer: LG. Used condition. May show signs of wear and tear. What's in the box: Watch, Band. NOTE2: LCD Screen has defective pixels/spots. Trending at $54.55eBay determines this price through a machine learned model of the product's sale prices within the last 90 days. Lg Smart Watch W110. Condition is Used. Shipped with USPS Priority Mail. LG GizmoPal 2 Pink Verizon. Great condition. Barely worn. Lg Gizmopal 2 VC110 WIFI Blue. Verizon / Page Plus / Straight Talk No Service. This is necessary to keep your right to file a claim. Warranty claims are subject to the discretion of the original product manufacturer. 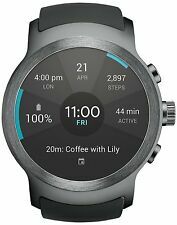 LG Watch Urbane 2nd Edition W200A GSM Unlocked Smartwatch Stainless Steel Black. Condition is lightly Used. I had this watch for awhile, I liked it but got a different watch. Everything seems just fine. Just figured i would sell it jnstead of letting it sit in a drawer. A fusion of classic style and the latest wearable technology. As Unique As You Customize the G Watch R to match your style. Swap out the wrist strap to customise your watch with your own or any standard 22mm watch band and adjust the watch face to match your mood. NEW! 60 day money back guarantee! 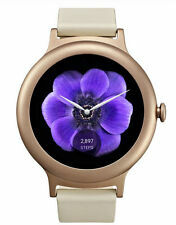 LG 300 Smart Watch. Condition is New. Shipped with USPS Priority Mail. Brand new never used, white in color, comes with charging usb cable, and a perfect smart watch for anyone. Please check out my many other auctions. Have fun and happy bidding. All OFFERS are appreciated best regards Taryn Cara. LG Watch Sport W280A 45.4mm Titanium Stainless Steel Case Black Classic.... Condition is Used. Shipped with USPS Priority Mail. LG Watch Sport. Screen is in great condition. Minor scratches around the edge. Used for only about a year. Fully functional. Bought from AT&T and can use NumberSync to receive calls, texts, and notifications. Also includes key to install SIM card. Only used with Bluetooth connectivity. Unlocked GSM. Cleared Google account and factory reset. Includes original box, and instructions. Includes 3rd party charger stand and cord instead of original. IT HAS NEVER BEEN USED AND SEEMS TO HAVE EVERYTHING WITH IT. New is new. If we make an error, we will do our very best to correct it. LG GizmoGadget VC200B Verizon Wireless Wearable Smart Watch. Condition is Used. No accessories . Shipped with USPS First Class Package. LG W200V Urbane 2nd Edition 4G LTE Verizon Wireless 4GB updated Wear OS 2.23!!! LG W200V Urbane 2nd Edition Android 4G LTE Verizon Wireless 4GB Smart Watch. This watch has been updated to Wear OS 2.23That means you have the more modern notification cards that pop up, you can edit what the hardware buttons do and more! Look up 'Lg Urbane 2 update' to see all the new features that this OS offers! Battery holds a great charge, screen is in excellent condition. Comes with: the watch, A preinstalled glass screen protector, (excellent condition!) a usb charger, and a new installed Verizon NFC nano SIM. Shipped via USPS Priority Mail. LG Gizmo Gadget- Verizon LG-V200 Red, Used. This is in great condition and was very gently used. Comes from a smoke free home. This is a great smart watch with excellent compatibility. Built in bluetooth V4.0, it can be compatible with Bluetooth V2.0 and up enabled smartphones and tablets. Compatible with Android 2.3 and up, such as Sumsung S3, S4, S5,S6, Note 2, Note 3, Note 4, HTC smartphone and SONY smartphone. LG G Watch LG-W100 406KPSL0038406. Condition is New. Shipped with USPS Priority Mail. The item is gently used in great working condition with minor sings of previous use. The band(adjustable) has minor stains and creases. The digital display is in great shape. LG Gizmo Pal 2 Smart Watch Blue - (Verizon) LG-VC110B NO CONTRACT. Device is factory reset, ready to use through Verizon. Include charing cable. New, in package sticker pack to customize screen as desired. Condition is Used but in very good to excellent condition. Shipped with USPS Priority Mail. Perfect for kids. Download the Gizmo app and know where your kids are at all times with the GPS feature. Perfect introduction to younger children to a phone-type device. 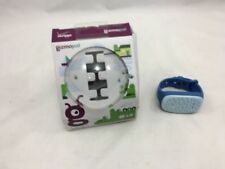 NEW Verizon GizmoPal 2 - LG-VC110 Kids Smartwatch. Condition is Used. Shipped with USPS. Full-Circle P-OLED Display for Stunning Image Clarity. Compatible with Android™ 4.3 or higher and iOS 8.2 and later (with limited functionality). In good condition. Only the watch is included. No accessories. Lg Gizmopal 2 Vc110 Verizon/Unlocked Blue. Condition is Manufacturer refurbished. Shipped with USPS First Class Package. All this is displayed on a beautiful 1.3" P-OLED display set in a sleek stainless steel body. Best of all, this LG smartwatch is highly customizable, so you can swap out the wrist band or adjust the look of the watch face when you're ready for a new look. Model Watch Sport W280A. The LG Sport Watch is a smart watch with a stainless steel titanium case and a black classic silicone rubber buckle bracelet. 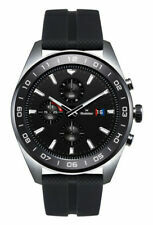 Attractive sports watches are fashionable in their work and suitable for sports. The Verizon LG Gizmo Pal 2 LG-VC110 Kids Smartwatch Pink (Verizon Wireless). Kids smartwatch with a pink rubber material strap. Compatible with Android and iOS devices and with the Verizon Wireless Network. Used LG Watch Urbane, stainless steel. Nearly perfect condition, with two bands.